You will be given a reference e-book to read which has 428 pages And the test will be based on that e-book , you can take final test within 1 year of purchase. Construction Project Management (CPM) refers to the overall planning, control and coordination of a construction project from its inception up to the time when it is completed. The process requires the construction project manager or leader to make sure that the completed project is capable of meeting the requirements of a client, making it more financially and functionally viable. If you are thinking of getting your construction project management certification, then you should keep in mind that your most common responsibilities once you start to practice a career in this field will be divided into seven major categories and these include cost management, project management planning, contract administration, quality management, time management, construction management, professional practice and safety management. Certified construction project management experts are also required to perform vital activities and tasks within an organization and these include defining the management structure and responsibilities of the CPM team, leading and organizing the team through project control implementation, defining responsibilities and roles and establishing protocols for communication and determining project construction and design elements. Deciding to earn a construction project management certification will require you to improve your skills in specifying the plans and objectives of a construction project including scope delineation, establishing standards and requirements for team performance, budgeting, selecting participants for the project and scheduling. Also included among your responsibilities are to maximize the efficiency of resources by procuring labor, equipment and materials, develop effective methods for resolving conflicts and implement different operations through properly coordinating and controlling plans, contracting, estimating, designing and constructing the whole construction project. 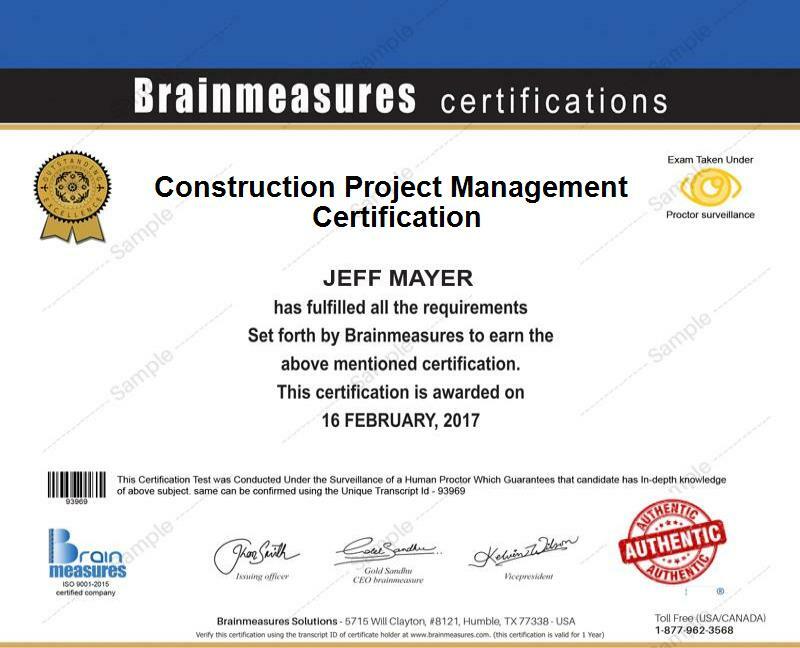 If earning a construction project management certification is your major objective, then you should know that Brainmeasures can offer you a high quality and comprehensive training. Brainmeasures offers the most detailed and accurate construction project management course so it is greatly possible for you to hone your skills and improve your knowledge in the field of CPM. Deciding to get your certificate from this legitimate online certification company is the wisest move that you can take as the topics and information covered in its program are not only accurate but are also updated. An online construction project management test is also provided by the program. This test has been developed by the CPM experts in Brainmeasures so expect to get the highest level of assessment by taking and passing it. The construction project management certification program is intended for various professionals in the construction industry. You can expect this program to work perfectly for beginning graduate students, advanced undergraduates or professionals who wish to further improve their knowledge in construction, architecture, facilities management and engineering. The certification course aims to let these individuals understand that the entire construction project management certification process is such a challenging, exciting and dynamic one and requires skills in effectively managing construction projects and recording the past construction practices used. Working as an expert in the construction project management industry is capable of increasing your annual income. You can expect to earn an average salary of $82,000 after you receive your construction project management certification.